Leon Kass, former chair of the President’s Council on Bioethics from 2002-2005, has a nice lecture on the University Channel Podcast. 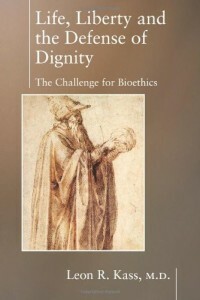 He is also the author of many books, including Life, Liberty, and the Defense of Dignity: The Challenge for Bioethics. We are largely unaware that we have, as a society, already embraced the eugenic principle, “defectives shall not be born.” Because our practices are decentralized, and because they operate not by coercion, but by private reproductive choice. In Part I, he begins by discussing the traveling exhibit on Nazi Germany called Deadly Medicine: Creating the Master Race. He outlines the exhibit’s three stage progression to Nazi eugenics, and emphasizes that the “science as salvation” value system is very prevalent in the west, and we should take note. Is there any connection between our ethics-free quest for perfection and murderous eugenics? He argues, like many others have over time, YES, there are logical and historical connections between eugenics and the tendency to look to science for salvation. NOTE that he is not anti-science, just warning against a total faith in science. Is this the unavoidable end for those of us who worship science as the only arbiter of truth? It doesn’t have to be, Kass argues. Science in itself does not lead to such horrors, but the Nazi use of medical science was less a perversion, and morea logical conclusion from dubious premises and attitudes in their scientific outlook and the role of science in human affairs. Is there something deadly wrong in looking to science for salvation? The essence of the peril, he argues, lies in the pursuit of the perfect human. “Eugenic vision and practice are gaining strength, all the moreso because they grow out of sight, behind the fig leaf of the doctrine of free choice. We are largely unaware that we have, as a society, already embraced the eugenic principle, “defectives shall not be born.” Because our practices are decentralized, and because they operate not by coercion, but by private reproductive choice. “Not surprisingly, in the face of these practical possibilities, prominent intellectuals are now providing justification for this view of life. The current journals of bioethics, no less, are full of writings that sweetly sing the song of Binding and Hoche, albeit without the menacing German accent. But not all are so reticent. When the death of a disabled infant will lead to the birth of another infant with better prospects for a happy life, the total amount of happiness will be greater if the disabled infant is killed. The loss of a happy life for the first infant is outweighed by the gain of a happier life for the second. Therefore, if killing the hemophiliac infant has no adverse affect on others, according to the total view, it would be right to kill him. In a recent magazine interview, the professor was asked, what about parents conceiving a child specifically to kill him, take his organs, and give them to their ill older children. Professor: It is difficult to warm to parents who take such a detached view, but they are not really doing something wrong in itself. Interviewer: Is there anything wrong with a society in which children are born for spare parts on a massive scale? Do not underestimate what it means for us that such coolly lethal opinions, regarded since 1945 as barbaric, are today again treated with seriousness, and that promoters of such opinions can occupy professorial chairs of ethics like Princeton’s. These three lectures are each over 90 minutes long, but really full of information. What I really find interesting is that the ties between Darwinism, eugenics, the devaluing of human life, and the logical and historical connection between the salvific science and Nazism are so clear, yet so vehemently and blindly denied by anti-faith and pro-Darwin leaders and sheep. I also find interesting Kass’s point that this devaluing of “imperfect” humans is happening hidden behind our extreme “choice” morality – not via compulsion, but via personal liberty gone awry. Freely chosen euthanasia, like the current abortion of most Down’s Syndrome kids, can easily lead to forced euthanasia if we let the Darwinist, science as God moralists lead us. Forced euthanasia is already happening in Holland. Will human life really be better if we turn to biotechnology to fulfill our deepest human desires? Will those desires be properly satisfied? Will our enhanced activities be better, and better humanly? The question we must therefore put to the human enhancers and the post-human futurists is this – “What knowledge of the human good do you have that entitles you to gamble the human future on your hunches that these proposed alterations will in fact make us better or happier?” It is a question that science and technology can not answer, and worse, that our bio-prophets do not even think to ask. No danger we face in the coming age of biotechnology is greater than the danger of careless and shallow thinking. Sheesh, reminds me of Gattaca. Bit scary really. When I found out that the Alpha-Fetoprotein testing was only to determine if the baby had defects that would cause it to die at birth (and so you could abort the baby in the case of those defects), I refused the rest of them. My theory being that if the test showed the baby would die, then I would just be made to be sad very early. I would carry it to term, regardless. I would never abort my baby, I would say that even if they told me it would kill me to carry to term, I'd beg them to save the baby. That is just me. So, anyway, I never worried myself over the Alpha-Fetoprotein testing. Christians, you act as if science itself is this big scary Pandora's Box. Oooo Ahhhh! I think Christians fear science for two reasons. 1. Science keeps pushing God aside. Evolution in particular explains species where before it was a case of "God did it." If scientists can complete work on the unified theory of gravity, which explains physical existence, God will be pushed into the gaps even further. Science makes it tougher and tougher to say "God did it" from a literal Biblical interpretation. Opinion: This reminds me of the growing pains religion went through when Copernicus proved the Earth was not the center of the universe. Religious people threw a fit. Christians are just going to need to grow up and deal with reality. 2. Christians don't feel that people are morally ready to handle the implications of the huge strides science is rapidly making. What makes it worse for Christians is that science is secular in nature and so Christians feel scientists and secular culture as a whole lack the morals that Christians have. Opinion: I think that not being ready to face the ethical dilemmas science presents is a valid fear. Lawanda pointed to a fear of a "Gattaca" like scenario. Like it or not though, technology is advancing and humans will be forced to deal with it. My hope is that we can deal with it with 21st century ethics and not a medieval biblical mindset. I never worried myself over the Alpha-Fetoprotein testing. This reminds me of the growing pains religion went through when Copernicus proved the Earth was not the center of the universe. Myth, never happened that way. But you are right, religious people have in some ways resisted science because it pushes out superstition, but not real faith. Don't forget that most of the great scientific discoveries of the 18th and 19th centuries were made by Christians. Most of the "Christianity has impeded science" nonsense is a myth created by anti-Christian secularists to perpetuate their disdain for faith, both genuine and perverse. As Rodney Stark points out in his many books, Christianity almost single-handedly prepared the way for and nurtured modern science into existence. Christians don't feel that people are morally ready to handle the implications of the huge strides science is rapidly making. I agree there, and they are probably right. While the amount of science information doubles every few years, our ethics threaten to not keep pace. Those people worried about nuclear disaster are not fools, neither those who worry about release of pesticides or GMOs into the environment, nor those worried about pollution, or genocide, esp. a second "intelligent genocide" like that of Hitler – the logic is plain and compelling. And despite your pejorative reference to the "medieval biblical mindset," the modern mindset that has yielded Communism, Nazism, and Socialism isn't much to brag about. Arguably, the great freedoms we enjoy today are a fruit of Protestant theology, mixed with secularism. "The morals Christians have"?! What are they? I know the morals xians profess, but I have also seen the morals xians HAVE. Quite a difference! Faith and superstition are the same thing. You're just splitting hairs. You have said you believe in witchcraft. Most of the "Christianity has impeded science" nonsense is a myth created by anti-Christian secularists to perpetuate their disdain for faith, both genuine and perverse. And despite your pejorative reference to the "medieval biblical mindset," the modern mindset that has yielded Communism, Nazism, and Socialism isn't much to brag about. And who do you blame Nazism, Communism and Socialism on? Duh, who else? Socialist countries are more successful compared to the United States especially in science. When your daughter grows up to be a geneticist while believing species have no genetic relation to each other and she goes up against a Chinese scientist for a job, she won't stand a chance. It used to be that job outsourcing was limited to manual labor but now the trend is brain drain. The damage people do to their children with their religious beliefs is harmful in that it's limiting their children's options. I feel sorry for you Seeker because maybe you could have been a good biologist if you weren't such a religious fundamentalist about evolution. Anyone can read Genesis. There is no "Creation Science" about it. It's simply God made Adam and Eve and everything else. Yay, can I get my Creation Science degree now? Um, first, that's your caricature of faith. Second, I have never talked about witchcraft here – you must have me confused with someone else. Case in point; YEC Creationism. You've got to be a brainwashed ignorant fundamentalist to believe this stuff. To be a YEC you need to tell yourself the speed of light is not a constant so E=MC2 is wrong. I'm working on a post on the speed of light. The fact is, you are just being boorish and argumentative. Even if light has changed speed (and there is a lot of discussion about variations in light speed, as well as current lab work where we slow light down experimentally), this does not mean that e=mc2 is wrong. That's just your send up of what YECs believe. I have made good arguments to show that evolutionary thinking has and does impede science (e.g. junk DNA, vestigial organs), but you are making unsubstantiated claims based on your disdain for YEC claims. And who do you blame Nazism, Communism and Socialism on? Certainly not Christianity, but instead, atheism, Darwinism, and human reason gone astray from God. Socialist countries are more successful compared to the United States especially in science. Who says? Just because the Germans were smart doesn't mean Fascism nurtured their intellect. I'd say that Christian Europe and the US have produced not only much of the best science (but not all), but much of the best of most other disciplines, not the least of which is human rights. Are you defending the beauties of Socialism? I'd not be surprised, coming from a liberal ;). When your daughter grows up to be a geneticist while believing species have no genetic relation to each other and she goes up against a Chinese scientist for a job, she won't stand a chance. LOL. Since evolutionary thinking has little impact on real genetics or medicine (classic genetics focuses on inheritance, gene expression, the sequence of the genome, etc. ), she'll probably be head and shoulders beyond her peers who are steeped in evolutionary folklore, and will be sure to be free to come up with viable solutions rather than waste eons of time and government moneys following evolutionary rabbit trails of illogic, trying to figure out such things as why Neanderthal man's DNA is nearly exactly like ours ("Did they share genetic material with homo sapiens?" Duh). The damage people do to their children with their religious beliefs is harmful in that it's limiting their children's options. I feel sorry for you Seeker because maybe you could have been a good biologist if you weren't such a religious fundamentalist about evolution. Yes, well, we can pity one another, how's that? Not in the least. You obviously have no idea what creation science is about. Second, I have never talked about witchcraft here – you must have me confused with someone else. I will say that the way our culture soft-pedals witchcraft is a concern for Christian parents. From books and movies like the HP series, to the nice witch cartoons, I think we are promoting harmless imagination that could lead people into less harmless black magic activities later in life. I don't think most people appreciate the dangers involved, esp. for kids that don't have a good family life to keep them balanced. Kids who have a positive experience of "nice" witchcraft may seek out the darker side of it if they are antisocial or emotionally hurt. Oh my God, WITCHCRAFT ISN'T REAL! Oh, there you go arguing from the authority of your bible, the Webster's inspired dictionary. In one sense, you did "get me" – perhaps you could provide a link to the original reference. However, whether or not witchcraft is "real" is only inferred from what I said. Whether or not it is real in the sense that there is real spiritual power involved, if people believe it is real, and decide to kill animals and maybe children in the belief that it will get them spiritual powers, that IS harmful even if it is not "real." You get it? And quite honestly, there may be demons and other dark spiritual forces involved in witchcraft. Or maybe it's just mind control, who knows. Anyway, you are very astute at missing the point because you are looking for reasons to find fault and paint me as some crazy extremist. Too bad for you. BTW, I am becoming more convinced of the link between Godless philosophies and totalitarian governments, and between Darwinism and eugenics and Nazism. But I'll have to post more on it because people are slow to learn such things. But I again highly recommend that you spend the time listening to at least the first of these three lectures from this man who is not evangelical or religious in his approach to bio ethics and history. He is just one believable voice among many who see the bankruptcy of the secular, evolutionary philosophy. When you said this, I could imagine Homer Simpson's voice saying, "Stupid dictionary – DOH!" perhaps you could provide a link to the original reference. However, whether or not witchcraft is "real" is only inferred from what I said. Give me a break. What you said about witchcraft is quite clear. Own up to it. You are looking for reasons to find fault and paint me as some crazy extremist. It's just my opinion but it seems to me that your statements may be in conflict with each other. Don't you agree? You are reading an emphasis that is not there. "Less harmless black magic activities" doesn't mean that the magic is real – it means that the activities, be they animal torture or whatever, are not harmless. Yep, I did make a mistake saying I never talked about witchcraft here, so one point for you. Now, that said, the reason I denied it is because I know I don't have a strong opinion about it, and have little interest (before now) in witchcraft or it's relative danger. So the accusations that I "believe in" witchcraft is, in my mind, not only inaccurate, but based on precious little data (though as it turns out, I did make that ONE little comment – care to look for more?). So, my point is, I don't find witchcraft to be harmless, and will write about it when I can. Does that mean I am all spooked by it, or somehow caught up in the superstition of it all? Hardly. So, I admit that I made a comment on it. Will you admit that my comment does not imply that I am some superstitious fundamentalist anti-witchcraft crusader? If you can't admit such, you have an agenda for sure. Yep, sorry, you'll have to allow me that wiggle room. My hope is that we can deal with it with 21st century ethics and not a medieval biblical mindset. My personal opinion is that people have NOT CHANGED despite the onset of science/technology taking over our lives. I think people now are exactly the same as people in medieval times, except maybe a bit cleaner – and therefore less likely to die of yucky diseases. Morality is now exactly what it was in whichever time period you decide to look at. There are bad people, there are good people. There are good people who make mistakes, there are bad people who change and start doing good things. I really don't think you can put a time period on ethics. You could pinpoint certain "regimes" in whichever time period you want that are awful or good. But really, do you not think ethics are the same now as they always have been? But really, do you not think ethics are the same now as they always have been? Heck no girl :) People don't change but their ethics certainly do. That means that there will always be good and bad people but what is actually considered "good" and "bad" not only changes over time but also from place to place. I've used the example of slavery before. The institution of slavery was accepted around the world for thousands of years before the age of reason. There are many biblical passages which regulate slavery. We also no longer stone non virgins on their father's doorstep. This was considered a "good" punishment that fit the crime but today it's considered "bad" to stone a girl to death for no being a virgin on her wedding day. I cite these examples because you can probably relate to them better but there are so many. The samurai thought it was a virtue to commit suicide for their lord. The Aztecs used human sacrifice to appease their God for the good of all mankind. The Jaine Buddhists believe that all life is sacred and that it is morally wrong to kill even a fly. It's a wide wide world out there and very very few morals have been held by every culture in every place in every time. Is the Jaine Buddhist a cult or a culture? I think there is a difference. Has it ever been "ok" to any one society (culture) to kill your brother so you could have his wife (or his tent or his sword or his food or whatever)? I don't see how you can say very very few morals have been held by every culture in every place in every time. Really. Like I said I think there are certain sects of people who do extreme things, but I think they eventually are stopped because the rest of the world knows better. I think that would hold with "natural selection" principles. Humans just know that killing other humans means an unsafe world for themselves as well (as you have pointed out before ;)) And so I think that rationally the moral of "thou shalt not kill" has been in every culture everywhere. Which is not to say that specific "cults" have not ignored the rule for their own gain. I also think that people without any help (teaching) or friends (like people in a church) are more likely to ignore the social rules of getting along with others, in order to get more power/money/food/whatever for themselves.